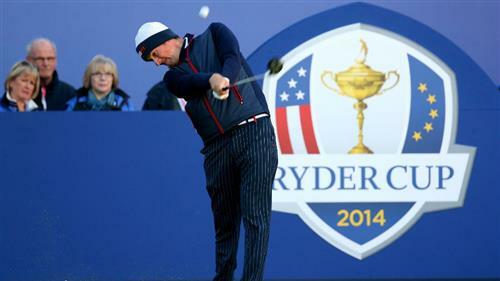 Want to know what sinking it from the bunker at the Ryder Cup feels like? Shouts of "come on baby" from Phil at the 6th, and come on it did. He puts it closest in the Battle of the Litigate. Hold the phone, Rory manages to put his tee shot close(ish). It's on the green, at least, which is saying something for the 6th. Umm, nope. His shot scoots off the back. There's a slight breeze picking up at Gleneagles now - that's not going to help matters. After sinking the putt for halve at the 5th, Sergio's lining up on the par-3 6th. Players have been struggling to get it to hold on this green. Can the Spaniard...? Beginners' luck? Playing without fear? Whatever it is, Spieth and Reed go 2-up against Gallacher and Poulter. I'm glad we're in agreement on that Greg. Baseball caps are over - bring on the golf woolly. Yeah, great hat, with a hat like that he gets a free bowl of soup. Garcia then saves playing partner McIlroy's bacon on the 5th, sinking the putt for par to halve. They're still 1-up in the last match out. Mickelson makes par on the 5th, while Bradley's left to do a set of bunny hops down in the rough just to see the pin. Out at the front of the pack, Europe's Rose and Stenson put their 2nd shots on the 8th in tidy positions just below the hole. Over to Bubba and Webb now. On the 6th and Match 3, I'd just like to pay tribute to the hat of Jordan Spieth. Where others choose baseball caps, Jordie's gone for the woolly number. It's a good look. What of the Battle Of The Litigation? Garcia and Mickelson find the ocean-like green on the 5th. Keegan Bradley... not so much. He pumps it into the rough, wide right. Seems like the US players are having trouble with the speed of the greens. Leaving a lot of putts short. Flicking back a couple of holes, Ian Poulter sinks the putt to halve after local boy Stephen Gallacher spanked it into the trees. Spieth and Reed still 1-up though. Oh and Rose nearly had my prediction nailed on there. 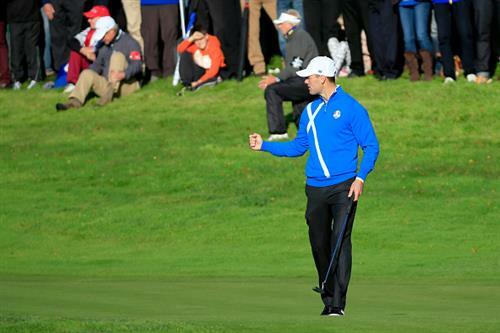 Putt to win the hole at the 7th misses just to the right, skimming the cup and sending European hearts into mouths. Team Europe still 2-up in Match 1. The first two hours - yes, two hours! - have elapsed. Europe lead in three matches, USA in one. I will bid you all a good day for the time being and bring to you Tristan Barclay, who will guide you through the inevitable USA fightback of the next two hours. I would still predict this morning session, never mind any other session still to come, is going to swing back in the USA's favour at some point. At one stage our poll was at 60-40 in favour of the USA. That's now closed up to 54-46. US confidence is draining faster than Sergio Garcia bunker shots. There's a little bit of home advantage coming in to play. You know what it feels like when you hit a good shot and your playing partners say nothing at all? You know how demoralising that is? Yeah. That. Stephen Gallacher having to take a drop. Think he also had to take a cab out of Gleneagles to find his tee shot. You can't let a moment of Spanish inspiration from a bunker in the Ryder Cup pass without a nod to Seve Ballesteros. That was pure Seve. Sergio. Of course he does. SERGIO GARCIA! Are you kidding me? Wow. He's holed from the bunker at the fourth. That's a birdie and the win. Wow. 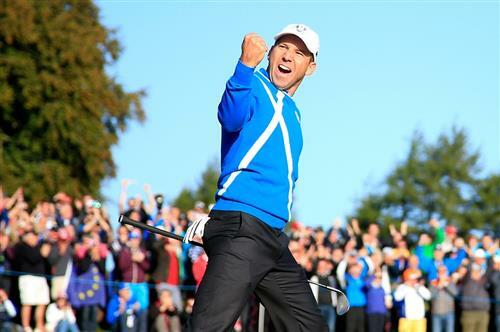 The first proper highlight reel moment of this Ryder Cup, and it's in the blockbuster match of the day. Stephen Gallacher has hit the worst tee shot of the day - yep, even worse than Webb Simpson's at the first. He's found a part of Scotland that even he didn't know existed. Henrik Stenson has a putt for the win at the sixth, but it drops off on the low side once again. Rose and Stenson stay 2-up on Simpson and Watson after six. And that's for the win at the fifth. Back to 2-down for Fowler and Walker against Bjorn and Kaymer. Rickie Fowler holes a putt! Breaking News: The USA have holed a putt! McIlroy to win the hole at the third - rotten putt, he was walking after it almost as soon as he hit it. That match remains all square, and has been the whole way along. Jordan Spieth to win the hole... and he's lipped out at the fourth. Jeez, the US can't buy a putt right now. Let's recap then - Europe are dominating the first two matches, USA are winning the third against Ian Poulter and The Battle Of Litigate is all square. Europe's morning, by a smidgeon, so far. Keegan Bradley almost holes his third at the third! It means McIlroy will need to make his putt to win the hole. Rickie Fowler rattles one in pin-high to the fifth green. He's 3-down, so needs something to happen. Good recovery from Rose after that interruption, hitting the green at the par-3 and leaving himself about 18 feet for birdie. Justin Rose distracted on his backswing at the sixth tee. That's the first (and hopefully last) time that's happened.